To ensure you do not miss one of these valuable posts or other resources covering PBL, STEM, 21st century learning, and technology integration please sign up for 21centuryedtech by email or RSS. As always I invite you to follow me on twitter (@mjgormans). Please give this post a retweet and pass it on to someone not as familiar with technology and Web 2.o. 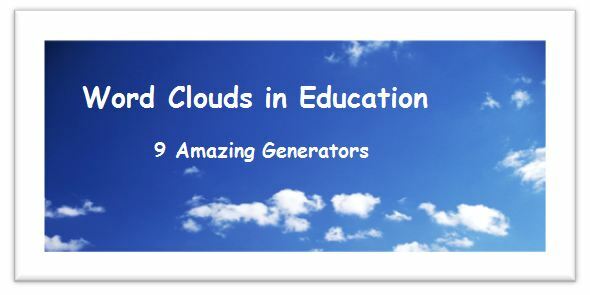 Word clouds are a great way for teachers just testing the Web 2.0 waters. ABC Ya – This application may be the most Wordle like and, in fact, operates much like Wordle. It creates final results that allow for font change, color change, and a randomized layout. It does not seem to provide the function on word frequency, important to more advanced users. Save options are in jpeg format and there are print options. If you are used to Wordle this application may be an good alternative. It does not require email or log in. Tagul – Tagul has some features that Wordle doesn’t, like custom shapes selection and multiple fonts usage in one cloud. It also allows for the use of tagged words that can act as pointers to URL’s if embedded in a web page. It abounds in options but registration may limit classroom use. Requires a log in with email. Word It Out – Much like Wordle, it creates word clouds out of any text that you paste into the text box. This application allows the word cloud to be customized by size, font, and color scheme. Word It Out also allows the user to ignore certain words and thus keeps them out of the word cloud. Can be used without a login, although the saving option requires an email. Can work around this option by right clicking to save as jpeg and/or screen print. Tag Crowd – While it does not give the color,unique style, or layout variation of of Wordle, it does allow one to see frequency of words. It also allows a file to be uploaded or a URL address to be used. The word cloud creations can be saved as a PDF files or printed from a full screen print menu. No login or email is required and free use of the product is for nonprofit use listed under creative commons. Wordsift – This hidden gem from Stanford University does not give the pretty effects of Wordle, but does give several awesome features that allow students to really analyze a word cloud. One unique feature allows words to be listed by how common or rare they are. Also allows for words to be listed in alphabetical order. Wordsift allows the user to click on words to view in an online visual thesaurus with dictionary, google images, and word sentence placement. It even allows the user to view words by subject area and cross curricular areas by unique color coding and definitions that relate to specific disciplines. Watch this video lesson on using Wordsift with students on a lesson about Dr. Martin Luther King Junior. What a great way to analyze a speech! It even covers assessment of students using Wordsift. No login or email required. Any printing or saving would need to rely on a screen print. VocabGrabber – Another creative tool that allows students to analyze a group of words. While it lacks the flashy pictures and clouds that Wordle can create, it has substance in creating lessons that can be used to really understand a word passage. VocabGrabber analyzes text and generates lists of the most useful vocabulary words then displays how those words are used in context. Copy text from a document and paste it into the box, and click Grab Vocabulary! VocabGrabber will automatically create a list of vocabulary from the text, which can be sorted, filtered, and saved. Click on any word in the cloud and a snapshot of the Visual Thesaurus map appears along with definitions for that word, and examples of the word in the text. TagCloudGenerator – This is a service that does not allow pasting in of text, but instead goes to a website that is entered by the user. The effects are impressive since the results are a moving flash file that can be downloaded. It also provides an HTML tag cloud. It even provides a service for WordPress Blogs. You Are Your Words – A very cool way to match words and a real picture that you upload. Watch this video to get a better idea. This is a free product from American Heritage Dictionary. While the website encourages a self portrait there could be a lot of possibilities. Remember that since this is a Web 2.0 site, students should not be sharing personal information in teh words that they supply and upload. It will give you sets of random words which you may then resize, move and rotate. One activity that works well with it is to give students a topic and then ask them to create a word cloud representing it from whatever random words they happen to get. They will have to be creative in order to do this and because everyone will get a different set of words they can’t copy each other. They then have to explain their creation to the class and how they tied it in to the topic. I’m not very familiar with word clouds. Incorporating technology in my classroom is something I am learning to do, and this article really opened my eyes to new things that I can try! Thank you for a great post! It will be interesting to learn more! Why is Tagxedo not mentioned? It’s a pretty good word cloud tool. Thanks for sharing… I will need to take a look at it! You may also like to check Phoetic. Not a web service, but an iOS app (0.99$) for creating pretty detailed photo word clouds. DISCLAIMER: I am the developer of Phoetic. Do a google search for the program Answer Garden…. it will do what you have asked! We just launched a new word cloud generator: http://www.wordclouds.com. Very easy to use on all devices. Many thanks for the alternative to Wordle. Used ABC Ya with my Grade 2 students for a Spelling activity and they loved it!